Tired of plain interiors, but looking for a low maintenance solution to suit a busy modern lifestyle? Parquet flooring is a great solution for those seeking a stylish and practical flooring solution for any modern home. Wood flooring is not only bang on trend, but makes it easy to clean spills and muddy footprints, while Parquet-style flooring adds a luxurious and decorative edge to your interior. What is Parquet flooring? 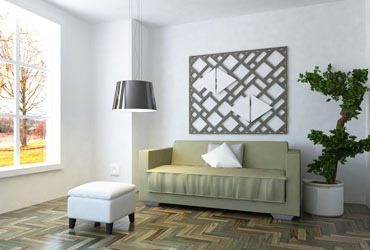 Parquet flooring typically comprises of wood panels which are arranged into geometric patterns. Perhaps most recognised is the traditional Herringbone pattern, which comprises of panels of wood abutted into a series of v-shapes to produce a ‘plaited’ design. This style is highly versatile for use in a period or modern home. For those seeking a truly contemporary edge however, the Chevron design is worth considering as it is a modern innovation of this traditional style, which negates the overlapping sections to achieve a more reformed, zigzag pattern. Parquet flooring was established in France in the 1600’s and at this time a skilled tradesman would have been required to arrange and fit the wood panels, that would have originally been applied directly onto a concrete base. Nowadays Parquet flooring is still available in this traditional solid wood medium, but modern alternatives such as engineered wood are also available and may be better suited for those requiring a hardy and resilient surface within their home. Modern Parquet flooring is also much easier to assemble, often pre-prepared with tongue in grove or click-fit joints ready for installation. As with plain wood flooring, Parquet is available in a variety of traditional wood finishes to suit any interior. Think trendy white and silver-toned engineered wood finishes for a modern outfit, or solid oak for a traditional property or country retreat. Whatever finish you ultimately choose, Parquet flooring works fantastically as a decorative statement within any space. Due to the grandiose nature of this flooring, Parquet can be paired simply with plain painted walls, opulent accessories such as plush cushions, tactile throws and high specification fixtures such as solid stainless steel door handles and ornamental light fittings. Read Shabby Chic Home for more helpful tips to guide you through your home improvements.